A University of Alabama student was removed from her sorority this week for sending a racist Snapchat photo bragging that no black women were accepted to her Greek house. The executive headquarters for the Chi Omega Fraternity confirmed Tuesday the woman who sent the image is no longer a member of the UA chapter. Rumors circulated online that the Snap was Photoshopped; Chi Omega spokeswoman Whitney Plumpton told The Huffington Post the image being passed around (visible below) is "not the original Snapchat image," although the original did contain the slur used in the altered version. "While the offensive word that was used is the same, the image used on these sites has been tampered with," Plumpton said. 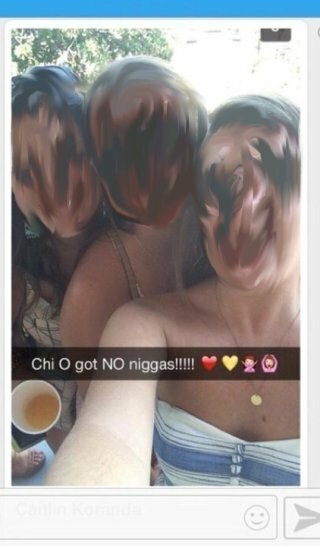 The Snap, captioned "Chi O got "NO niggas!!!!!" over a selfie, was allegedly sent on bid day, which was Saturday. The women's faces are blurred in the photo circulating online. The University of Alabama Greek system is under increased scrutiny this year, following the national attention in 2013 when sorority members began going public about how black women were systematically blocked from joining traditionally white houses, largely due to alumnae influence. Eventually, black women did begin joining the sororities, including a handful at Chi Omega. The university hosted its largest sorority rush in history this year, and offered bids to 21 black women, according to the Associated Press. As many of you already know, one of our students posted a photo on Snap Chat on Saturday afternoon that included particularly offensive racial language. I immediately asked the Office of Student Conduct to conduct a full investigation and was assured by the national Chi Omega headquarters that they had already begun an investigation of their own. There will be appropriate University consequences once our investigation is completed. These consequences will be in addition to any sanctions Chi Omega’s national officers decide to impose. We are all extremely disappointed when any student uses language that is disrespectful or offensive to any segment of the UA community. We are especially sad that this incident occurred on a day that was an exciting and happy one for the young women who participated in fall recruitment. But as word spread Monday night, readers began suggesting to Total Frat Move and Total Sorority Move, websites that focus on college life, that the image had been altered to add the racial slur. This image, sent to Total Sorority Move, purports to prove the photo was altered. "What was expressed is absolutely reprehensible and completely inconsistent with Chi Omega's values and policies," the national organization said in the statement. "Chi Omega took swift disciplinary action in accordance with the organization's policies and procedures. The woman who took the photo is no longer a member of the chapter." Cathy Andreen, director of media relations at UA, told HuffPost the university's Office of Student Conduct is investigating possible violations of the Code of Student Conduct.